Kpreps.com takes you Around the Classes as we look at a handful of games in each classification from teams outside our top five rankings. Hutchinson improved to 6-1 after a 49-14 win over Haysville-Campus. Conor Craig led the way for the Salthawks with 232 rushing yards and four touchdowns. Tracy Harris also found two the end zone twice on the way to 91 yards rushing in the win. Junction City got the better of Gateway (Mo) 43-14 on Friday in a game played in Lansing. The Blue Jays defense held Gateway scoreless for the first three quarters as the offense built a 36-0 lead. With the win, Junction City improved to 6-1 on the season and will conclude the regular season on the road at Topeka Seaman. Shawnee Mission West rolled rival Shawnee Mission South 42-14. The Vikings racked up 282 yards on the ground and four touchdowns. Kirby Grigsby, Zach Witters, Jason Meeker, Reggie Edwards all found the end zone for the Vikings. Topeka High crushed rival Topeka West 62-7. Freshman Ky Thomas rushed 16 times for 228 yards and two touchdowns. Quarterback Corey Thomas rushed for 96 yards and a score and threw for one more in the blowout victory. Maize improved 6-1 on the season with a 42-28 win over Salina Central. Dalyn Johnson carried the load for the Eagles, tallying 205 yards on 21 carries and four trips to pay dirt. Maize concludes the regular season at Hutchinson. Topeka Seaman scored a late touchdown to prevail 34-27 over Washburn Rural. Dalton Cowan found Janson Garmen for a 42-yard game winning touchdown pass to seal the Vikings win. Seaman battled back from a 14-0 hole and 24-17 deficit to finish the dramatic comeback. St. James Academy made the long trip down to Wichita and came away with a 28-17 win over Kapaun Mt. Carmel. The Thunder road the legs of Sammy Wheeler and Cody Schmidt as the two combined for 223 yards rushing and three touchdowns. Wheeler also threw a touchdown pass to Clay Lautt in the win. Shawnee Heights came away with a 18-6 win over Topeka Highland Park on Friday night. The T-Birds rushing attack of Christian Clark, Trey Jenkins, and Trey Brown combined for 295 rushing yards. Brown found the end zone twice in the Heights win. Louisburg stomped Fort Scott in their district opener 35-6. The Wildcats scored on all four of their first half possessions to break the game wide open and put the game out of reach. Louisburg racked up 291 yards of total offense in the first half alone. Thomas San Agustin rushed for 164 yards and three touchdowns. McPherson scored early and often and cruised to a 48-14 win over Hays. The Bullpups led 34-0 at halftime and did not look back. Andrew Powell scored twice in the first half for McPherson. Winfield earned their first win of the season with a dramatic 21-20 win over Wellington. Jayden Tate took a handoff on fourth-and-one in overtime and bull-dozed his way into the end zone to tie the game at 20-20 as the extra point gave the Vikings the win. The game marked the return of Winfield coach Linn Hibbs to Wellington where had a great deal of success as coach of the Crusaders. Coffeyville escaped with a 21-13 win over Chanute to improve to 5-2 on the season. The ‘Nado did all of its scoring in the first three quarters and intercepted a pass in the end zone late in the fourth quarter to seal the win. The Coffeyville defense picked off five passes on the night. Pratt outlasted Hugoton 31-28 on Friday night as Noah Myers connected on a 35-yard field goal as time expired. Hunter Kaufman and Travis Theis each scored twice in the Greenbacks win. Theis rushed for a 113 yards, while Kaufman added 82 yards on 11 carries. Hugoton rallied from a 28-7 deficit in the second quarter to tie the game with 1:40 remaining before Myers’ winning kick. Scott City pulled away from Colby in the second half and cruised to a 42-12 win for their fifth consecutive win. The Beaver defense held Colby to one touchdown in the second half, while Kevin Aguiler and Jarret Jurgens led the way offensively with five combined touchdowns. Nickerson shut out Wichita Trinity 32-0 to improve to 5-2 on the season. The Panthers were led by Austin O’Toole’s 148 rushing yards and two touchdowns, highlighted by an 83-yard scoring run. Baldwin picked up its first win of the season with a 60-0 shutout of Bishop Ward. The Bulldogs built a 47-0 halftime lead after scoring 22 and 25 points in the first two quarters. Baldwin will host Osawatomie in a district contest this week. Bishop Ward will look to end its 27-game losing streak this week when the Cyclones host Prairie View. Conway Springs delivered a key 21-20 victory against rival Garden Plain in District 10 play – one of Kansas’ best all-around districts. The teams, both 6-1, were tied at 14 at halftime before Conway Springs held Garden Plain at the Conway Springs 42-yard line on 4th-and-7. The Cardinals then scored their go-ahead touchdown. Nate Pauly tallied a 67-yard run on Garden Plain’s next possession, and the Owls went for a two-point conversion with the pass falling incomplete. Garden Plain went 65 yards late in the game setting up and 4th-and-2 from the Conway Springs 12-yard line. Pauly rolled out left for a pass to the end zone, but the ball fell incomplete. For the Cardinals, Trenton Jones had 20 carries for 133 yards, including a 76-yard run, while Colton Terhune tallied 18 carries for 101 yards and two scores. Garden Plain held a 319-314 yardage edge and also ran four more plays. A major difference came on the key downs. Conway Springs was 7 of 13 on third/fourth down, while Garden Plain was 6 of 19. Pauly rushed 29 times for 174 yards and three scores. Maur Hill-Mount Academy improved to 5-2 with a 28-24 victory against one-win Pleasant Ridge. Maur Hill, with 19 victories in the last three years, opened 1-0 in District 2 and is the only team with more than two wins in the district. Junior running back Ronald Faulk-Tindal rushed for scores of 43 and six yards and the Ravens added a 75-yard fumble recovery for a score. Riley County rolled over Minneapolis, 64-0, and moved to 4-3, 1-0 in District 13 with three teams with winning records. Senior Garrett Staten rushed for scores of three, one and five yards. Senior Wes March threw scoring passes of five and 34 yards and completed 7 of 9 passes for 121 yards. Junior Tyler Halstead had scoring runs of 29 and 22 yards. Junior quarter back Jace Ruder had a standout performance as Norton fashioned a 48-14 home victory against Russell in District 14 play. Ruder had touchdown runs of nine, one, and 19 yards and threw touchdown passes of 14 and 60 yards. Norton will play host to rival Phillipsburg in what should decide both playoff spots. Wabaunsee delivered a 36-16 win against Centralia in the close District 2. Washington County is 2-0 in district play along with Valley Heights while Wabaunsee is 2-1, though Valley Heights defeated Wabaunsee. Wabaunsee, 3-4 overall after navigating through a challenging Mid-East League schedule, faced Centralia for the first time since 2011. Senior Kameron Wurtz completed scoring passes of 39, seven and nine yards. He threw four touchdown passes in the first six contests. Kolby Droegemeier had 25 rushes for 154 yards and two scores for his sixth 100-yard rushing performance. 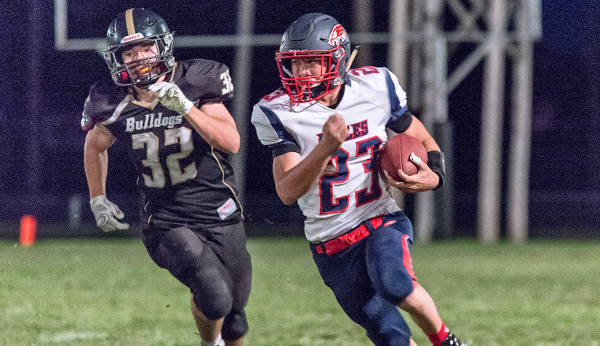 Chase County defeated Olpe, 14-7, in a critical home District 3 victory. Lyndon is 7-0, while Chase County stands at 5-2 and Olpe is 3-4. From 2004-15, Chase County had lost nine straight to Olpe, none within 14 points. Chase County took a 7-0 lead in the second quarter on a 50-yard touchdown run from Doyle Conley, who finished with 14 carries for 152 yards. He later pushed the score to 14-0 with a 64-yard run in the fourth quarter. La Crosse avenged a road district loss to Ellis last season and delivered a 44-12 road victory in the opener of District 7 play. The Leopards won their third straight after a 0-4 start. Fullback Jasey Woods carried 18 times for more than 200 yards and a touchdown. Clayton Herdman had 23 carries for 137 yards and three touchdowns. Brad Collins finished with 17 carries for 98 yards. La Crosse’s big, experienced line helped the Leopards give Ellis its fourth straight loss. Ellis led 6-0 early, but La Crosse scored twice for a 16-6 lead at halftime when Herdman and Woods scored. La Crosse finished with 503 total yards, including 447 on the ground, and limited the Railers to 197 total yards. Valley Heights stayed in touch with the District 2 playoff contenders with a 26-22 win over Jackson Heights. The Mustangs rushed for 317 yards in the game in building leads of 14-6 at halftime and 20-6 after three quarters. Hunter Stevenson rushed 19 times for 122 yards and a touchdown to lead Valley Heights. Stevenson now has 1,206 rushing yards and 15 touchdowns on the season. Jackson Heights, which began the season 4-0, has lost three straight games and has been eliminated from the playoff contention. Oxford delivered a key 58-42 district victory against Cedar Vale-Dexter. Oxford is now 3-0 in District 2, while Cedar Vale-Dexter is 2-1, along with Peabody-Burns and Central Burden. Oxford led 44-36 at halftime when the Wildcats scored 22 points. Dalton Silhan finished with 309 rushing yards and five rushing scores of 52, 28, 26, six and four yards. Oxford scored the first five times it had the ball and six of the first seven. The Spartans briefly closed the game to 44-42 in second half, before the Wildcats scored on two of its next three possessions to pull away. Oxford is 5-2 after a 1-8 season last year and just 27 victories entering this fall under 10th-year coach Shawn Burkes. The Wildcats last made the playoffs in 2006. Oxford is at winless Flinthills this week before a home game in Week 9 against Central Burden with significant playoff implications. Clifton-Clyde is in a strong position to earn a playoff berth out of District 3. The Eagles won, 51-20, against Centre-Lost Springs on Friday. Clifton-Clyde continued to pull ahead as the game went along. The Eagles led 7-0 after the first quarter and 17-6 at halftime. Drake Steinbrock rushed for two touchdowns of six and two yards, and caught a 20-yard scoring pass from Caleb Charbonneau. The Eagles, with just three victories the last two years, are now 6-1. In district play, Clifton-Clyde has lost to Burlingame but beaten contenders Herington and Rural Vista. Clifton-Clyde has a game against Onaga this week in the Eagles’ final district contest. Hoxie delivered a 28-12 road win against WaKeeney-Trego in District 8. The Indians scored all their points in the first half with eight first quarter and 20 second quarter points. Then, WaKeeney-Trego scored six points apiece in the third and fourth quarters. The Indians moved to 4-3, while the Golden Eagles lost their fourth straight after a 3-4 start. Hoxie, with no seniors, finished with 11 penalties for 114 yards. Junior Troyal Burris finished with 15 carries for 114 yards and two scores. WaKeeney ran 66 plays, 16 more than Hoxie, but finished 8 of 30 passing for 82 yards with a touchdown and an interception. The game featured six turnovers, two fumbles and an interception by both squads. Hoxie is 3-1 on the road and is a win away from its seventh straight winning season in eight years under coach Lance Baar. Logan-Palco kept its playoff hopes alive with a 50-0 win against Lincoln. Logan-Palco (6-1, 2-1) will travel to Solomon (5-2, 2-1) in a game that will likely decide the runner-up spot in District 4. Junior David Thompson collected six touchdowns and 218 rushing yards. Leoti-Wichita County picked up a fourth-consecutive win by beating Kinsley, 54-6. Kolton Sheppard rushed for 120 yards and three touchdowns for the Indians. Jorge Gallegos added 61 yards on the ground and two scores, and threw a 70-yard touchdown pass to Kyle Ricke. The Indians travel to No. 2 Spearville this week. South Barber made quick work of Stafford in a 50-0 victory. The Chieftains scored 22 points in the first quarter and 28 in the second. Stafford actually had a 38-32 advantage in snaps and committed just one penalty for five yards. South Barber had four penalties for 40 yards. Senior quarterback Grant Cantrell finished with a standout performance with seven of nine passing for 127 yards and four scores against no interceptions. He also rushed 12 times for 88 yards and three scores. South Barber didn’t score on defense/special teams, but senior Gavin Doherty collected a 35-yard punt return, and the Chieftains recovered two fumbles. The Chieftains are 6-1, 3-0 in District 7 play, with a road game versus Ashland (4-3, 2-1) this week. Pretty Prairie and Chase are also 2-1, though South Barber has beaten both teams. Lakeside-Downs continues to emerge from District 5. The Knights had lost 19 straight contests, including the first four this season, before three straight victories. On Friday, Lakeside moved to 3-0 in district play with a 70-32 win at Thunder Ridge. Dawson Johnson had more than 300 yards passing and eight scores in the win. The Knights have played the No. 4 strength of schedule in the classification and have averaged 34.9 points a contest. Lakeside has a key home game versus Wilson (4-3, 1-2) this week. In the district, Lakeside is 3-0, followed by Northern Valley and Stockton at 2-1. Lakeside has defeated Northern Valley and plays at Stockton in Week 9. Stockton (2-5, 2-1) is at Northern Valley (3-4, 2-1) this week. Northern Valley kept its playoff hopes alive with a 68-44 victory at Sylvan-Lucas Unified in close District 5. The Huskies trailed 24-22 after the first quarter but outscored Sylvan-Lucas over the next two quarters, 38-12. The Huskies ran 14 more plays than the Mustangs, and had a huge game from junior quarterback Caden Kinderknecht. He rushed 27 times for 232 yards and six scores. As well, he completed five of eight passes for 98 yards and a touchdown. Northern Valley finished with 517 yards of total offense. Triplains-Brewster shut out Tribune-Greeley County 50-0 on Friday night to pick up its first win. The Titans, who have played a challenging schedule, rushed for 271 yards and five touchdowns in the game. Jaden Schmidt led the way with 94 yards and two scores. Hudson Stramel passed for 93 yards and two touchdowns, while adding a touchdown run. Wichita Homeschool scored 38 points in the first quarter in rolling to a 62-14 win over Sunrise Christian Academy. T.J. Masterson rushed for 65 yards and two touchdowns, and passed for 70 yards and two more scores. Regan Messner caught two passes for 93 yards and one of Masterson’s touchdown passes, while freshman Jonah Wolters caught the other on a 10-yard reception. Veritas Christian won a third straight game with a 60-16 victory over Cair Paravel. Michael Rask rushed for 280 yards and five touchdowns in the victory. The Eagles led 28-8 at halftime, but broke the game open with a 24-point third quarter. Trey Huslig rushed for a score and threw two touchdown passes for Veritas. Cair Paravel was led by Freemann Greene’s two rushing touchdowns. Cheylin topped Natoma 35-18 in the final week of the 6-Man regular season. Manuel Castillo rushed 33 times for 188 yards and two touchdowns to lead the Cougars. Erik Perez completed 8 of 11 passes for 117 yards and two scores to Carter Porubsky.